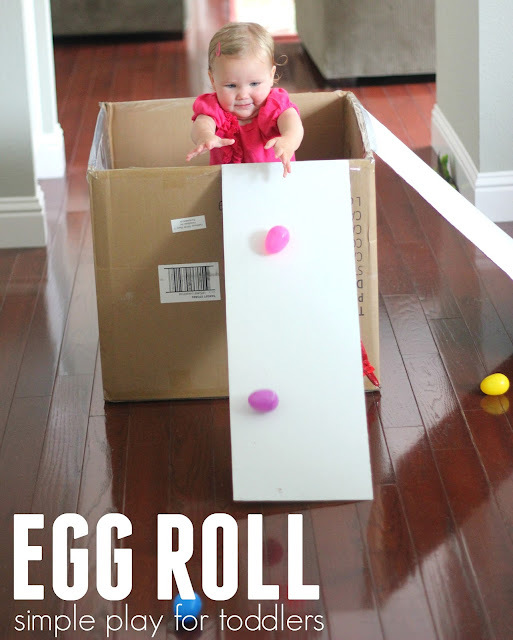 OH MY GOODNESS YOU GUYS, this Toddler Egg Roll Activity might be my FAVORITE thing we have posted ever. We've done car ramp play and we've even done ramp painting, but multiple ramps, plastic eggs, and a big box has taken the fun to a whole new level. GO FIND A BIG BOX! Your first order of business is to find a big box, or even a big plastic tub that is deep enough to contain your child BUT shallow enough that they can reach the top. WHAT AN EASY SET UP! Once you've found a big box, you'll need a few things. Start by cutting up your tri-fold display board into three long pieces (2 sides, and 1 larger center piece). Next, push the flaps on your big box inside of the box so that you have one big open side. Tape the cardboard bi-fold pieces onto the top of the box to create three ramps coming down the sides. Once all of the sides are taped, you're ready to play! Grab a bunch of plastic eggs and put them inside the box so that your toddler has easy access. My daughter was especially excited about the eggs being close to where she stood because it was so easy to reach them and then stand up and drop them down the ramp. We did this activity several times today with my big kids and then just me and Annabelle while the kids were all in school. My job was to collect all of the eggs that she rolled out of the box and return them so that she could play again and again. If you need to get dinner made or wash some dishes or get some emails sent, just pull this box ramp into your kitchen and your kids will be occupied for awhile (at least mine were!)! Just don't trip on any eggs while you are running around! Did you know that ramp play helps introduce kids to some basics physics concepts. With older toddlers and preschoolers you can even add in some predicting and some variables to change up this activity and test angles and friction. Make some eggs heavier by adding some items to them and sealing them shut. As you try things out, have the kids test to see which angles help the eggs most faster/slower... which items slow down the eggs/speed them up... and which eggs move faster, heavy or light ones. Have you tried any of our other Easter activities yet? We are on Day 3 of our A Very Toddler Easter series that we are co-hosting with Susie at Busy Toddler. Every day this week (for 5 days) we are EACH sharing one simple Toddler Easter activity and then you can click on over to our A Very Toddler Easter main page and see all of the activities in one easy spot. Not only can you roll eggs down these ramp, you can roll all sorts of cars and toys too! Try it out and tell me what ends up being the most popular thing to roll at your house! I'm dying to know.